The Alberta Historical Resources Foundation and the Minister of Culture has officially adopted the name Adams Lake for a small lake in Red Deer County (see information bulletin). The lake is approximately 100 hectares (250 acres) in size and located about two kilometres south of Raven and 35 kilometres west of Innisfail. The adoption of this name is significant as it commemorates the Adams family, who homesteaded in the region, and recognizes a name that has been used locally for about 100 years. The name commemorates the family of David and Julia Adams. David Arthur Adams was born in Stratford, Ontario. As a young man he met Julia Marie Hedlund, of Chippewa County, Minnesota at a hotel in Lakota, North Dakota. 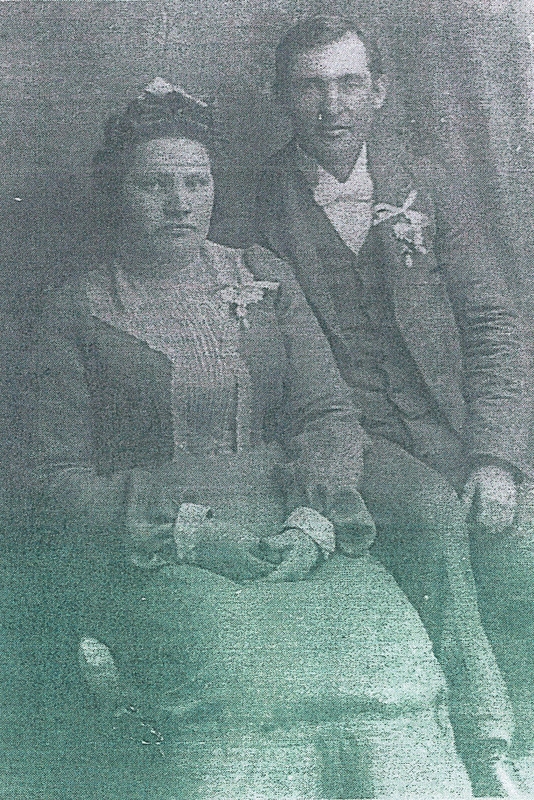 They were married in 1902 and lived for a time with David’s parents in Birtle, Manitoba. The couple soon struck out on their own and lived for a time in Vancouver and Mission, British Columbia and in Calgary, Alberta. Ultimately, in 1912, they settled on a homestead in the Raven District. The homestead, NW2-36-4-W5, was on the eastern shore of a small lake. The lake had been previously noted as “Lake No. 3” in a 1904 Dominion Land Survey Plan of Township 36-4-W5 and it appears unnamed on most federal government maps of the region following that date. It became popular with people from as far away as Spruce View for skating in the winter months and after 1912, it became known to locals as “Adams Lake,” likely due to the family’s proximity. By the time the Adams’ had settled near Raven, they were raising six children, and four more were born during their time at the homestead. According to David and Julia’s descendents, the land the family was working was not ideal for agriculture and, perhaps for this reason, at the age of 42, David Adams enlisted for service with the 187th (Central Alberta) Regiment during the First World War. Following the war he returned to farming. However, as the older children grew up and left home for farms in the neighbouring districts, and other careers of their own in Spruce View, Bowden, Innisfail and Rocky Mountain House, the farmstead was not sustainable and at some point in the 1920s David and Julia also left the area. David passed away in Calgary in 1942. Julia lived with her children in the Dickson and Kevisville districts and the Pigeon Lake area before also passing away in Calgary in 1966. Although the Adams family remained in the general area for some time, their direct association with the lake was relatively short. 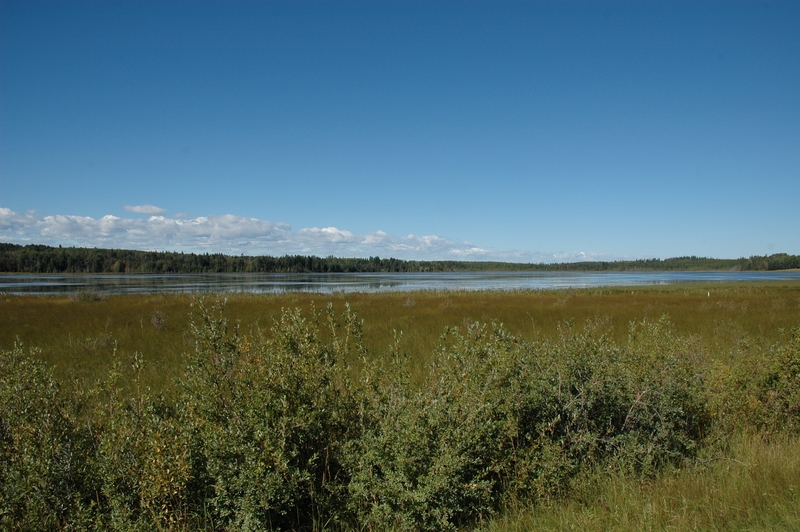 However, field research done by the Alberta Geographical Names Program in 1981 and 2012 found that the name Adams Lake was still being used by many local residents and that the name had been in use since at least the 1920s, probably even longer. The lake has also been identified by that name in local publications, newspapers and water conservation reports for the area. In Alberta, geographical names are adopted after being evaluated against the “Principles of Geographical Naming.” These principles can be found in the Geographical Names Manual. The principles to approve names are based on national and international standards and guidelines and hold that names that have a demonstrated local and/or historical usage should be given primacy when names are being considered for features with no official name. In 2011, Robert Nanninga, a resident of the Raven area applied to Alberta Culture to have the long-standing, but unofficial name given official recognition by Alberta Culture. A considerable amount of information was provided by the applicant and the region’s local history (Grub Axe to Grain…). However, the real breakthrough came when another area resident put researchers in touch with Ken Adams, a grandson of David and Julia. Through him connections were made with Georgina O’Coin, a granddaughter, and Edith Hudson (née Adams), the last surviving child of David and Julia. 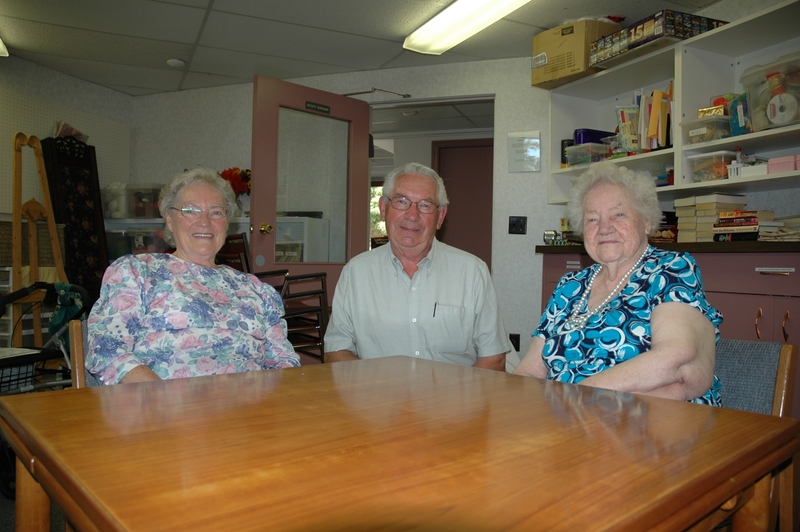 When these three family members were interviewed in Red Deer in August 2012, Mrs. Hudson was 101 years old. The information given during this interview proved invaluable in firming up the history of the lake and family by providing more details than were included in the local history. It was a true pleasure to be able to meet with the descendents of this homesteading family. 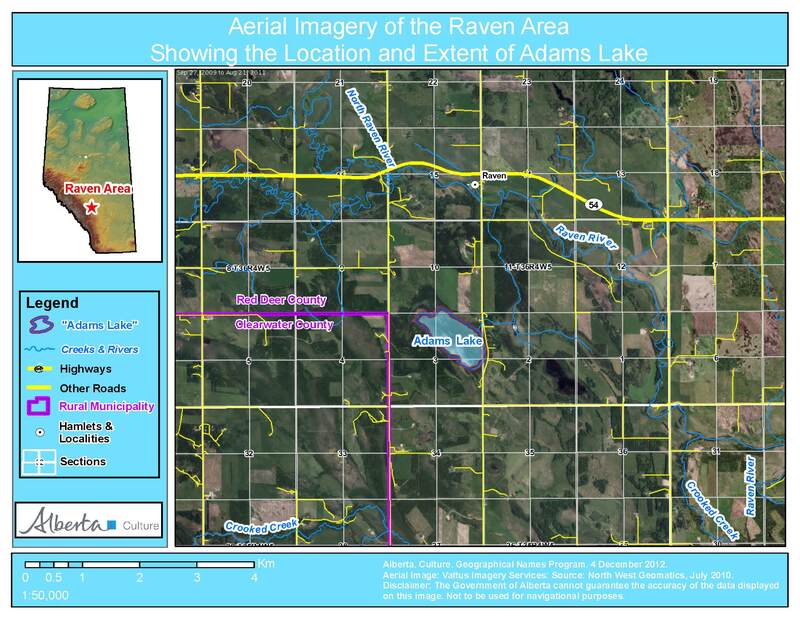 The Adams Lake naming proposal was supported by the Municipal Council of Red Deer County. 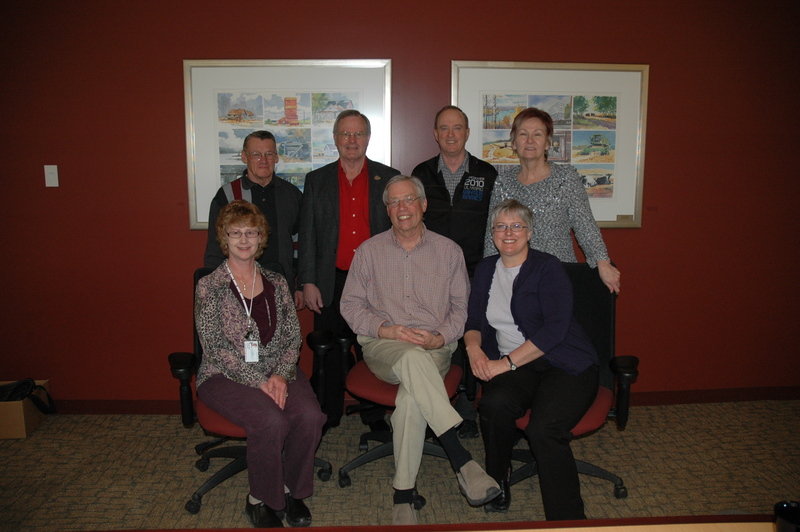 The Board of the Alberta Historical Resources Foundation decided to officially adopt the name during their October 20, 2012 meeting in Banff. On November 19, 2012, the Minister of Culture concurred with the board’s decision and the adoption of the name became official. Notification of the adoption of the name Adams Lake was published in Alberta Gazette on January 15, 2013. Notification of the new official name has been communicated to provincial mapping authorities and to the Secretariat of the Geographical Names Board of Canada for inclusion in the Canadian Geographical Names Database, ensuring that the name will appear on new maps of the region produced by the federal and provincial governments. Description: Approximately two km south of Raven and 35 km west of Innisfail (town). Grub Axe to Grain…: A History of Craig, Dickson, Happy Hill, Heckla, Hola, Markerville, New Hill, North Raven, Raven, Red Raven, Rich Hill, Spruce View (Spruce View: Spruce View School Area Historical Society, 1973). Available from Our Future Our Past: The Alberta Heritage Digitization Project, University of Calgary, http://www.ourfutureourpast.ca/loc_hist/toc.aspx?id=7618. How do you determine whether or not a proposed change (what we call an intervention) is appropriate for a historic place? Would a fresh coat of paint preserve the heritage value of an old house? Does painting the brick affect its heritage value as a Municipal Historic Resource? How do I choose the colour of paint? Answers to these questions and more are found in the Standards and Guidelines for the Conservation of Historic Places in Canada (or the S&Gs for short). Introduced in 2003 and revised extensively in 2010, the S&Gs are the definitive framework for heritage conservation in Canada, having been widely adopted by municipal, provincial, and federal authorities as a tool for determining how to conserve and manage change to historic places. The S&Gs provide a foundation of conservation principles organized around fourteen standards, a standardized vocabulary of conservation terms, a straightforward decision-making process, and practical conservation guidelines for a wide range of resource types. Used in conjunction with Statements of Significance, the S&Gs also play a role in determining if work is eligible for conservation grants from the Alberta Historical Resources Foundation. The presentation below, from the 2012 Municipal Heritage Forum, offers an overview of the S&Gs as a tool for municipalities to manage the historic places identified through surveys and inventories and subsequently protected as Municipal Historic Resources. A treasured monument honouring the service and sacrifice of the soldiers of Central Alberta has been designated a provincial historic resource. 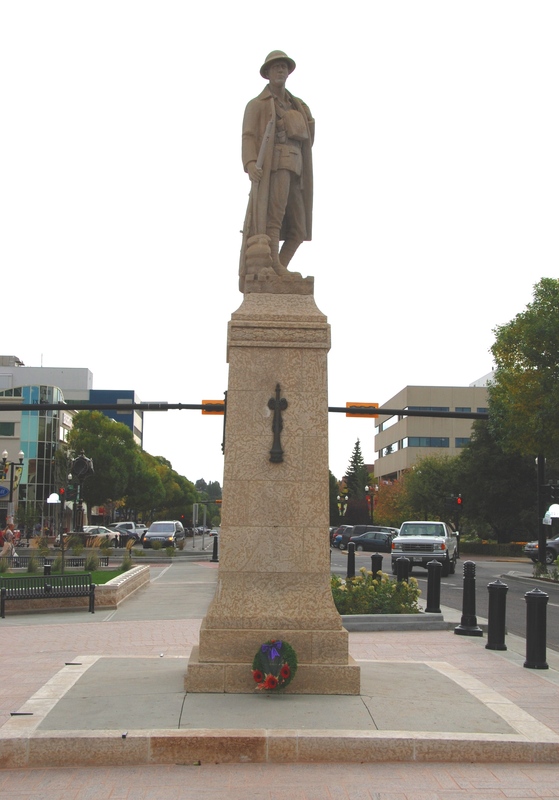 The Red Deer Cenotaph is located on 50th Avenue, the city’s historic main street, near the CPR Railway Station that was the embarkation point for those on their way to the European front. Unveiled on September 15, 1922, by Lord Byng of Vimy, Governor General of Canada, the cenotaph is one of the earliest and best known works of Major Frank H. Norbury. A native of Liverpool, Norbury was a skilled carver, decorated veteran and a major contributor to artistic culture in Alberta. The depiction of the Unknown Soldier in full World War I dress kit that stands atop the limestone base evokes the weariness and resolute purpose of those who served far from home. Alberta currently has more than 350 provincial historic resources. These sites embody the diversity of our province’s history and include medicine wheels, tipi rings, fur trading and mounted police posts, coal mines, farmsteads, ranches, railway stations, grain elevators, churches, schools, government offices, commercial blocks and private residences. Along with helping to provide economic, social and cultural benefits, designation of provincial historic resources helps to ensure that local landmarks will continue to help connect Albertans with their rich heritage. For more information on the Provincial Historic Resource Designation program, click here. Visit the Alberta Culture Newsroom to read additional releases. Heritage Advisory Bodies aren’t pep squads but they do need P.E.P! Members of the Holden Heritage Resources Committee (Municipal Heritage Forum 2011). 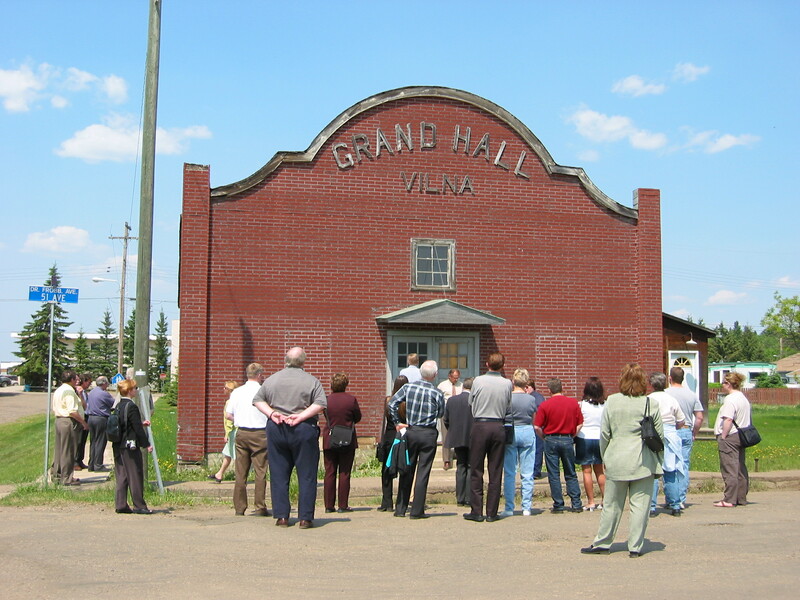 As a best practice, the Municipal Heritage Services Unit of Alberta Culture encourages municipalities that are developing local heritage conservation programs to establish a heritage advisory body. A heritage advisory body could be a board, commission or committee that advises Council on matters pertinent to the development and management of a local heritage program. Essentially, a heritage advisory body has the important job of providing public input and expertise to Council so that informed decisions about the municipality’s heritage will benefit current residents and future generations. 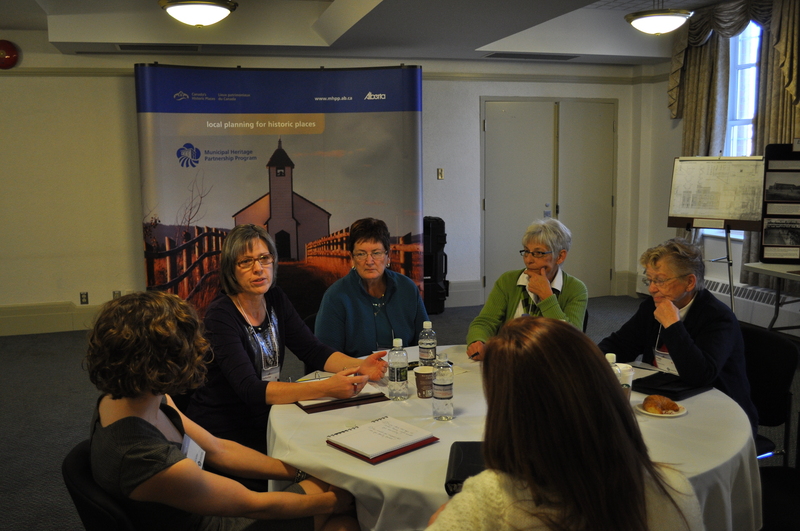 Heritage advisory bodies can also play a key role in fostering community interest and support. So what does pep have to do with heritage advisory bodies? Well, a quick search on Dictionary.com defines “pep” as being indicative of high spirits, energy, or vitality. While these are great traits for a municipal heritage advisory body, these groups should also possess another type of pep: Planning, Engagement and Partnerships. 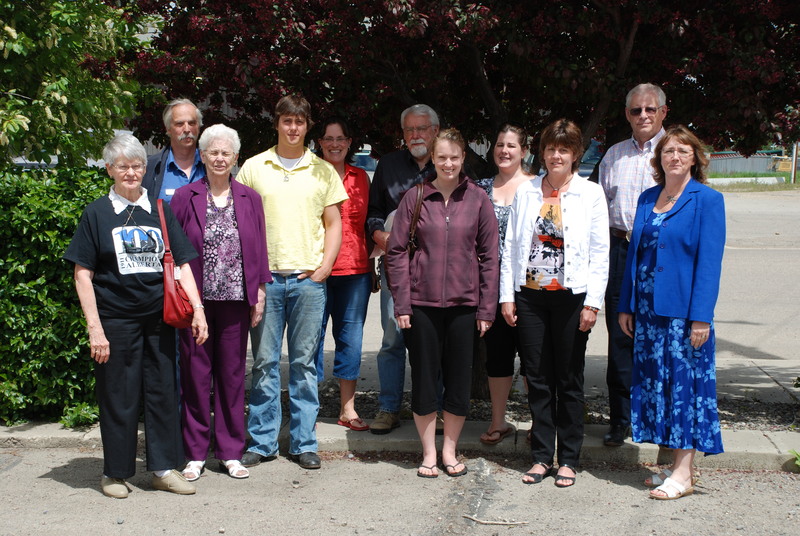 Yellowhead County Heritage Advisory Board and municipal staff (2011). Planning – A wise man once taught me: “Prior preparation and planning prevents poor performance.” This holds true for the development of local heritage conservation programs. For a municipality (and its heritage advisory body) to effectively manage historic resources it should learn about, understand and plan for the successful protection and conservation of significant places. A heritage advisory body, representing the broader community, plays a key role in planning projects that identify potential historic places, evaluating sites for heritage value and determining appropriate procedures and policies for managing an effective heritage program. The Municipal Heritage Partnership Program has a suite of cost-shared grants designed to assist with the completion of these projects. Tour of historic places in the Village of Vilna (2002). Engagement – Why do we conserve heritage? Many answers come to mind but the most commonly referenced speaks of how present and future generations will benefit from improved community identity and a stronger sense of place. Ultimately, this reason transforms heritage conservation into something that is very people focused, as opposed to place specific. So, when planning don’t forget to engage the community benefiting from heritage conservation! Find ways for residents to participate and experience their heritage: organize heritage awareness special events; develop educational material so that people may learn about and take pride in their community’s unique heritage. Be creative in your approach and have fun! Heritage awareness or research grants offered through the Heritage Preservation Partnership Program may assist with these types of initiatives. Vulcan Regional Heritage Project Steeering Committee – a collaboration between Vulcan County, Town of Vulcan and the villages of Carmangay, Champion and Milo (2011). Partnerships – Heritage is holistic and so its conservation and celebration can’t be completed in isolation. As a result, heritage advisory bodies should engage and partner with other organizations – especially community organizations that are atypical. That local hockey association, tennis club, wilderness organization or theatrical society might very well be planning the perfect event that could support some heritage engagement objectives. The members of those same organizations might also provide a new perspective or highlight additional opportunities related to heritage conservation. I challenge you: find a listing of community organizations, select the one that seems least likely to have an interest in heritage conservation and try to collaborate on a mutually beneficial project. Through partnerships and collaborations, awareness and appreciation of heritage will surely increase. This P.E.P. approach to heritage management will help ensure a collective community-driven attitude; a method that will strengthen and increase support and contribute to a community culture of conservation. The Alberta government has designated the Taber Courthouse, one of Alberta’s early seats of justice, as a Provincial Historic Resource. Built in 1918, the Taber Courthouse became the model for Alberta courthouses built prior to the Second World War. After being declared a judicial sub-district in 1917, the Town of Taber donated land for the construction of the courthouse building that would also house the local detachment of the newly-formed Alberta Provincial Police. The Taber Courthouse was also the site for meetings of local community organizations and the Taber Town Council. Following the dissolution of the judicial sub-district, the courthouse continued to be used for a variety of provincial government activities and in 1953 became the official Town Hall. 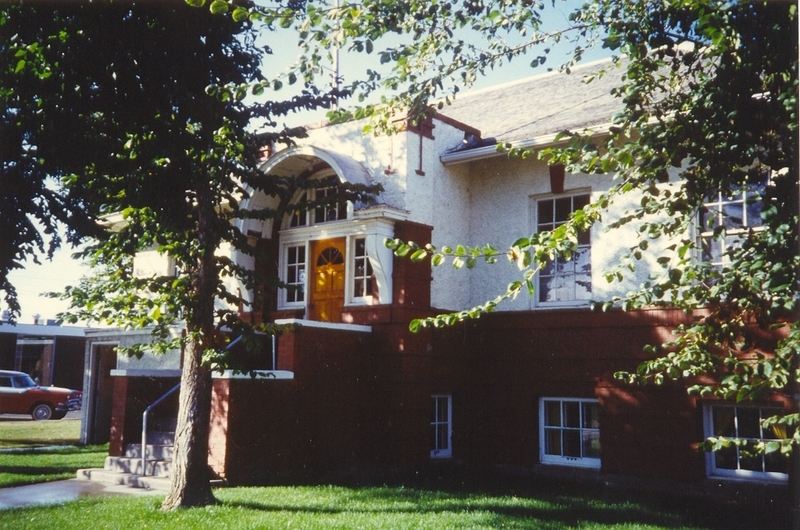 The courthouse currently serves as home to the Centre Court for the Arts, a multi-use arts facility operated by the Arts Council of Taber that showcases the work of local and provincial artists. Alberta currently has more than 350 provincial historic resources. These sites embody the diversity of our province’s history and include medicine wheels, tipi rings, fur trading and mounted police posts, coal mines, farmsteads, ranches, railway stations, grain elevators, churches, schools, government offices, commercial blocks and private residences. Along with helping to provide economic, social and cultural benefits, designation of Provincial Historic Resources helps to ensure that local landmarks will continue to help connect Albertans with their rich heritage. For more information on the Provincial Historic Resource Designation program, click here. Wheatland County recently designated two Municipal Historic Resources that are now listed on the Alberta Register of Historic Places. You can find Wheatlead County a few kilometres east of the City of Calgary and adjacent to the Siksika Indian Reserve. The area was settled in the 1890s and the two sites reflect very different themes in Alberta’s history. The St. Andrew’s Anglican Church is a small church located in the Hamlet of Gleichen, just north of Siksika Nation. It was built in 1885 by Anglican missionaries to the Blackfoot nation. The descendants of the Blackfoot people and the area’s settlers worship here to this day. 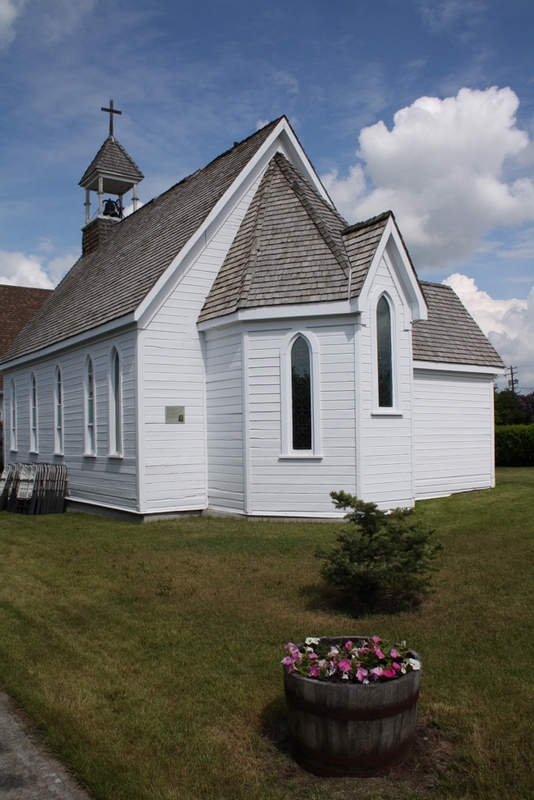 This little chruch is quite likely one of the oldest Anglican churches in Alberta. 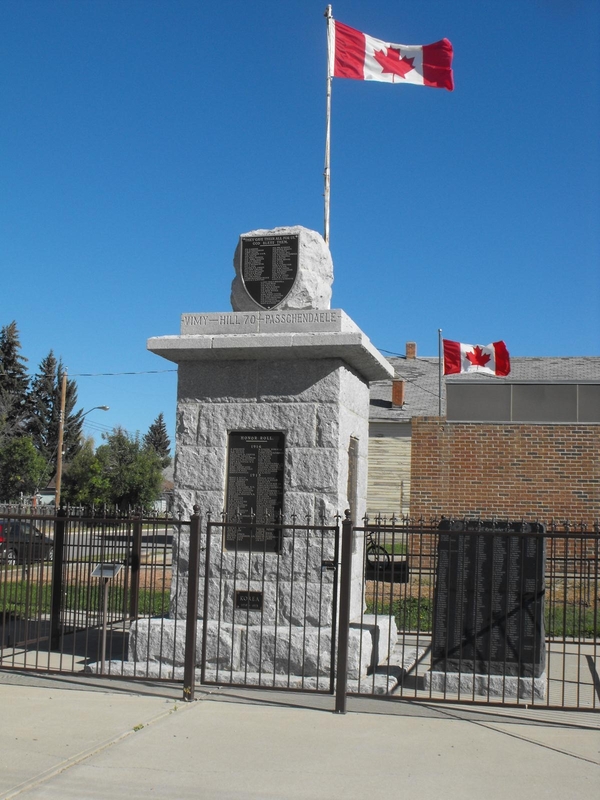 The Gleichen War Memorial Cenotaph is located in the Hamlet of Gleichen as well. Is was built in 1920 as a monument to the 51 men from the area who lost their lives while fighting for Canada in World War I. Plaques have subsequently been added to honour soldiers from the area who died during the Second World War, the Korean War and the mission to Afghanistan. The County of Minburn recently listed one of its newly designated Municipal Historic Resources on the Alberta Register of Historic Places. 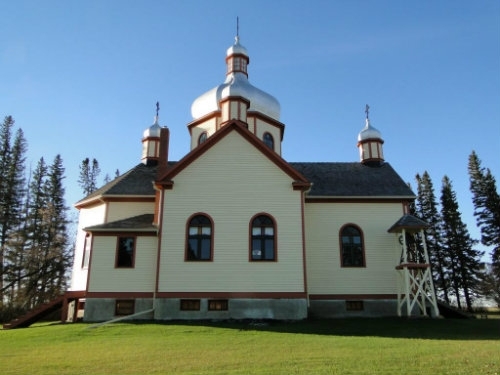 The Ukrainian Orthodox Church of the Dormition of St. Mary of Sich-Kolomea (otherwise known as Sich-Kolomea Ukrainian Orthodox Church) is one of the many historic resources that tell us about Ukrainian Canadian settlers. 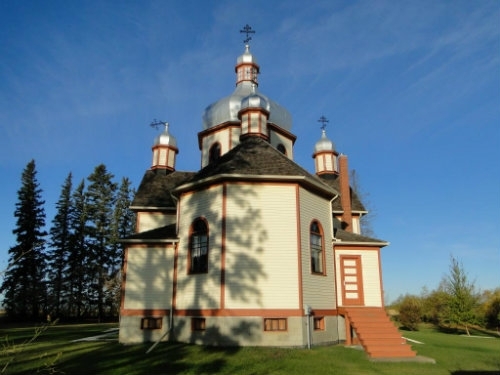 The Sich-Kolomea church is valued by the county because of what it conveys about the Ukrainian Canadians setters who built it. The church served the pioneer farmers of the area, and was the first church in what was to become the Vegreville mission district. It is also a beautiful example of the Canadian interpretation of the Byzantine style of church architecture seen in many eastern rite churches built on the Canadian prairies. There are many municipal and provincial historic resources that tell us about the Ukrainian Canadian settlers in east-central Alberta. You can use the advanced search features of the Alberta Register of Historic Places to learn more about the places that form their legacy.